L.I.R.P. 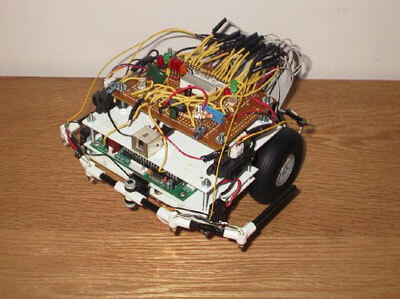 is a robot that uses LED's to indicate operations. It uses two IR rangers, IR proximity detectors, and 2 bumper sensors. something. It also has a 10 LED bar graph to show light levels. OOPIC controllers voltage regulator. I have used every I/O line on the oopic. and I think its turned out pretty good.